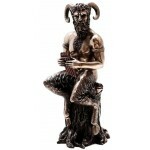 The Greek God Pan is perhaps the most familiar form of the Horned God/Wild Man archetype. The Greek God Pan is perhaps the most familiar form of the Horned God/Wild Man archetype. Our classical imagery of this country-dwelling deity is derived from the Homeric Hymn to Pan. He is an ancient god indeed, harkening back to the old hunter/gatherer societies with their horned or antlered shamanic gods. But with animal domestication Pan became the herdsman's god associated with goats. His original worship was in Arcadian Greece. The ancient scholars of Alexandria believed that Pan personified the Natural Cosmos, and the word Pantheism is derived from this idea, that all Nature is God and that God is All Nature. Pan had a positive side that was portrayed as the laughing, lusty lover and musician; this side of Pan was called "pangenitor" the all-begetter. But like all the Gods of Nature He had a shadow side as well. In this form He is called "panphage" the all-devourer and as such He was perceived as a dangerous protector of the Wilderness. This cast resin statue is hand finished and stands 6 1/2 inches tall. Item Number: MT-PANPIPE | Approximate Size (Inches): 3.00 wide x 3.00 deep x 6.50 high | Approximate Shipping Weight: 1.00 lbs.